Martin Axon Master Printer, expert in platinum and palladium printing. Gallery and photographer testimonials. "I have worked with Martin Axon on behalf of many artists since the mid 1980s including Robert Mapplethorpe and Adam Fuss among others. Martin Axon has a sensitivity and awareness in working with artists that results in a platinum print of the highest quality. In my opinion he is singular, there is no one working at this level in the art and photography world today." "I have known and worked with Martin Axon for over 20 years and I have always appreciated the commitment and artistry he brings to every print. Working with the most delicate material he coaxes life out of the platinum material to make the most beautiful and visceral prints that will not only stand the test of time but will transcend the very notion of time." reliable, he is superb at what he does!" "The blacks are blacker, the whites are whiter. It's photographically the most beautifull photographic object I have seen. I haven't seen a better process, I think it's perfection in a certain way". A new film Mapplethorpe had it's world premier at The Tribeca Film Festival. As Robert's Platinum printer and being a charcter in the film I accepted the role of playing myself in the film. Follow this link to get more information. 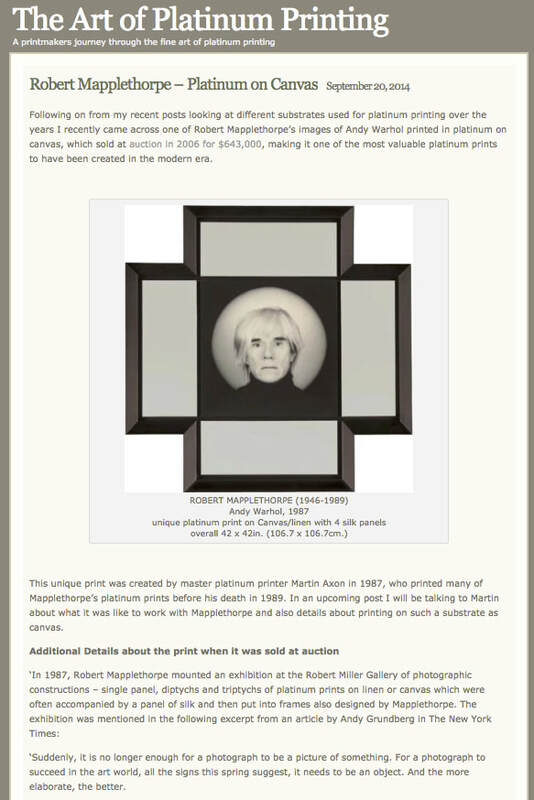 "Martin is my master printer, dear friend and partner on platinum editions. "Knowledgeable helpful and supportive with excellent results. "When I began doing my own platinum printing I admired the perfection of Martin Axon’s work even more. Martin Axon's platinum prints are of the highest quality. The prints have a deep and rich tonality, while maintaining a strong fidelity to the original image. His professionalism and sensitivity to the needs of his clients make him a pleasure to work with.